The Quote Board is used to easily view and trade multiple markets. 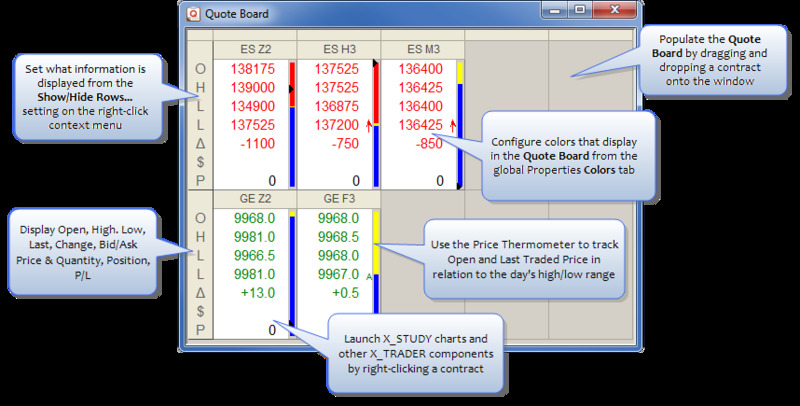 You can access the Quote Board from the X_TRADER Control Panel by selecting the icon. The Quote Board may be populated by dragging and dropping contracts directly onto it or by launching it from Market Explorer with the desired selected contracts. A single click will launch your Floating Order Entry window of choice when Floating Order Entry is enabled from the Quote Board right-click context menu. You may also submit RFQs (Request for Quotes) by selecting Send RFQ from the context menu.